Image caption Midge Ure's grandmother was from Northern Ireland, so he sees Saturday's show as a "homecoming of sorts"
If Midge Ure's name is forever intertwined with one city, it's certainly not Belfast. But the man who wrote Vienna and launched a thousand wispy moustaches has a lot of affection for this part of the world and can't wait to get back on stage here. The Ultravox frontman has always created grand, sweeping, filmic music and the chance to showcase it with a full orchestra at BBC's Proms in the Park was never one he was going to pass up. "I have been performing in Northern Ireland since 1972 so have seen Belfast in particular go through amazing changes," the Lanarkshire-born artist told BBC News NI. "The Scots and the Irish are so intertwined it always feels like a homecoming of sorts. My grandmother was from Northern Ireland so the roots are very much there." Titanic Belfast will provide the dramatic backdrop for Saturday's show and, having last year orchestrated his greatest hits on an album called Orchestrated, Midge is confident it will be a performance to savour. "It's always a huge high performing with an orchestra but to perform tracks from Orchestrated for the first time at the Proms is greater still," he said. "We did try doing an orchestrated version of Vienna back in the day but it was so disastrous I think the recording ended up on the studio floor in shreds… wrong arranger, wrong time to do it." Having embraced music from the moment his father spent half his weekly wage on a £3 guitar for his son, it wasn't long before the young Midge was making waves on the Scottish scene. In 1976, he hit Number 1 in the UK as the frontman for Slik, with Forever and Ever, a song co-written by Phil Coulter. He'd later taste more chart success with synth-pop pioneers Visage, sharing the writing duties on their 1980 hit Fade To Grey, and even had a spell playing guitar and keyboards for Thin Lizzy. 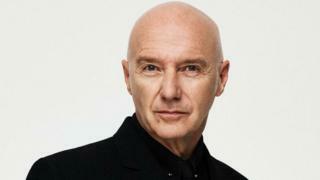 But it was a childhood sharing a one-bedroom flat with his parents and brother in Cambuslang, just outside Glasgow, that forged the steel that would later lead to stardom as the face of new wave icons Ultravox. As Midge says: "Music seems to come from the working classes mainly so a little hardship and doing without can be a great driving force as well as a great source of song-writing material. "You have to remember everyone else I knew lived in the same circumstances so you never really understood how poor you were financially." Living near Glasgow, as with Northern Ireland, bigotry was always a scar on the landscape - with the religious divides between Catholics and Protestants, Celtic and Rangers, part and parcel of tenement life. But despite growing up in a family of diehard Rangers supporters, Midge embraced the neutrality of music and is keen not to pass on any prejudices to his children. "I decided, because of the background I had, not to have my four daughters christened so they could choose what, if any religion they would adhere to without the 'passing down' of fixed beliefs and the sometimes negative twist those beliefs can hold." Image caption Midge Ure - pictured on the far left with Bob Geldof, Janice Long, Adam Ant, Elton John, Gary Kemp and Tony Hadley - co-wrote the Band Aid single Do They Know It's Christmas? Having known what it was to go without Midge didn't hesitate for a moment when fellow musician Bob Geldof rang him in 1984 and said he wanted to help famine victims in Ethiopia, having been moved to tears by Michael Buerk's report for the BBC. He produced and co-wrote the Band Aid single Do They Know It's Christmas, was integral in the organisation of Live Aid and along with Geldof started a charity push that would save countless lives. But Midge simply feels fortunate rather than proud to have been asked to help. "Being partly responsible for something which saved a life is a huge honour but it's a massive, life-changing thing to have been associated with something of the magnitude of Band Aid where there is no possible way to comprehend how many lives it affected and changed for the better," he said. "I'm not proud but lucky to have been part of it." "It did have a hand in breaking up Ultravox though, just by the sheer amount of time I had to spend away from the band. "But I was lucky and was allowed to get on with what I do without being tarred with the charity brush like Bob was." While Midge feels his charity work undoubtedly helped speed his exit from Ultravox, a 2009 reunion was "great fun" and felt "like slipping into a comfortable jacket". Getting the band back together coincided with a renaissance for 80s synth pop and a nostalgia boom which came as a very pleasant surprise. "When you created a piece of music back then (in the 80s) you expected it to have a shelf life of a couple of months but with the internet that music lives and breathes for diehard fans and the newer generation," says Midge. So getting back on the road to "churn out the hits" never felt like a financial obligation? "No. This is too much like hard work if you don't love what you do. I have never wanted to do anything other than this so still absolutely love it." BBC Proms in the Park in Northern Ireland will be presented on stage by Noel Thompson and Claire McCollum, with extracts from the Belfast concert being shown on BBC One and BBC Two on Saturday 8 September. BBC Radio Ulster will be broadcasting the show live from 19:30. Viewers can watch selected highlights from the Belfast concert at www.bbc.co.uk/proms.